Dream Deferred | Kanye West stands for president – but who’s laughing at whom? And yes, as you probably could’ve guessed in this moment, I’ve decided in 2020 to run for president. The press went into overdrive: Kanye has been ridiculed, mocked and dismissed. But who’s laughing at whom? 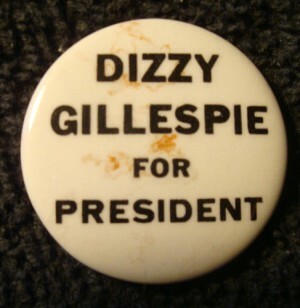 Kanye is not the first musician to declare that he intended run for president of the US: the jazz trumpeter Dizzy Gillespie did the same in 1964. There are strange parallels between Kanye and Dizzy. In 1964 the US presidential elections were a two-dog race – Democratic President Lyndon Baines Johnson (LBJ) and the Republican challenger, Barry Goldwater, a US senator from Arizona. Johnson was responsible for escalating the war against Vietnam and Goldwater was a rightwing animal. He was a red-baiter and voted against the civil rights bill. The idea that Goldwater could even run for president terrified Dizzy, so when jazz writer Ralph Gleason suggested that Dizzy would make a better candidate, the trumpeter announced his plans to stand. His campaign mocked the main parties – he just laughed at the political establishment. Drummer Max Roach is said to have volunteered to be Dizzy’s minister of defence, but as Dizzy made clear, “we’re not going to have any wars…so Max Roach will be given another role”. Dizzy then announced that Miles Davis would be made head of the CIA, Malcolm X would serve as attorney general. Other posts would go to Duke Ellington (secretary of state), Charles Mingus (secretary of peace), Ray Charles (librarian of Congress), Louis Armstrong (secretary of agriculture), Mary Lou Williams (ambassador to the Vatican) and Thelonious Monk (travelling ambassador). I’d have fought for a disarmament programme and the establishment of a world government, somewhere … I would see that everyone had enough to eat and some clothes and a decent place to stay. Everybody, every citizen, is entitled to that. Education would be beautiful, free, subsidised by the government. All of it. Anytime you wanted to learn something, I’d pay you to do it. Hospitalisation would also be free. I had a real reason for running, because the proceeds from the sale of buttons went to CORE, SCLC [the Southern Christian Leadership Conference] and Dr Martin Luther King, Jr, and I could threaten Democrats with a loss of votes and swing them to a more reasonable position on civil rights. Of course, Gillespie never had a chance of entering the presidential race let alone winning, but he did use the campaign to highlight the issues like civil rights and opposition to the Vietnam War. 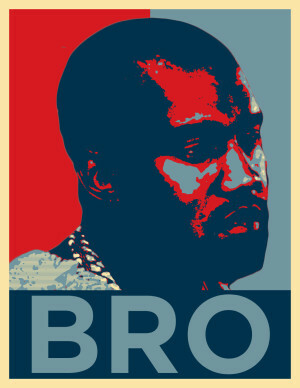 So what about Kanye West? Is he seriously thinking of running? Who knows, I certainly don’t. But I hope in a way he does. Of course I’d like to see the leftwing Democrat Bernie Sanders win the nomination and stand for president. But if he fail,s the idea that American politics is a choice between the Bush dynasty or Trump on one side and the Clinton clan on the other is too unbearable to contemplate. In the US, the police kill a black man every 28 hours. The US has the second highest relative child poverty rates in the developed world and, while approximately 12–13% of the American population is African-American, they make up a hugely disproportionate 60% of the almost 2.1 million male prison inmates. Kanye has spoken out on these issues and many more. Yes, he is a flawed and contradictory character. He has all the faults of a massive pop star and on occasions his sexism has been shocking. Like Dizzy, Kanye has no chance of winning but I like the idea of one of the most famous artists in the world rattling the Democrats’ and Republicans’ cage.